"Science Friday" and "Studio 360" presented "The Golden Record Remastered" Sept. 27, 2016 at The Greene Space at WNYC, calling on a "stellar panel of culture experts" to describe what would be on a modern version of the famous Golden Record sent into space in 1977. NEW YORK — In 1977, NASA sent two Voyager spacecraft off in different directions, each carrying a golden record with the sounds, greetings and music of the people of Earth. Now, those records are more than 10 billion and 12 billion miles (16 billion and 20 billion kilometers) away from Earth, respectively — and the radio program "Science Friday" says it's about time for an update. The cover of the Golden Record, copies of which were sent on the NASA's Voyager 1 and Voyager 2 probes in 1977. The public radio show, which airs a weekly episode focusing on science, partnered with the radio show "Studio 360" yesterday (Sept. 27) to reimagine what audio mementos of Earth such a record could hold if sent today. The event — held here at The Greene Space radio broadcast studio in collaboration with The Greene Space, Groupmuse and WQXR — kicked off a campaign to collect suggestions from the public and to build a "remastered" version of the artifact. The 12-inch (30 centimeters), gold-plated copper discs include sounds from nature, greetings in 55 languages and 27 selections of music spanning the globe and human history — plus some quirkier entries, like an hour-long recording of brainwaves from Carl Sagan's wife (writer and producer Ann Druyan) and the sound of a kiss. The spacecraft also carried diagrams of humans and DNA, maps of the solar system's location, and views from Earth encoded on the record. The focal point of the event, which was streamed live online, was a discussion of what to include on a new version of the record. Speakers included "Science Friday" host Ira Flatow, Studio 360's Kurt Andersen, WQXR host Terrance McKnight and Brain Pickings blogger Maria Popova. The event also featured live performances of classical pieces from the original record, played by the Ulysses Quartet, as well as a look at music's potential future, with avant-garde performances by the ensemble Tenth Intervention that depicted a long journey into space. There were also audio interludes in which members of the public shared their suggestions for an updated golden record. Violinist Hajnal Pivnick, co-founder of the musician collective Tenth Intervention, played a new piece at a "Golden Record Remastered" event at The Greene Space in New York City Sept. 27, 2016. The event focused on ways to update the famous Golden Record sent to space on the Voyager 1 and 2 spacecraft in 1977. The panelists discussed the challenges of representing Earth's population fairly and describing the scope of the human experience on just one "playlist," and each pitched his or her top suggestions for a remastered record to act as a time capsule for humanity. However, they didn't limit themselves to audio — a blockbuster alien film, beloved children's book and physical DNA all made the cut. 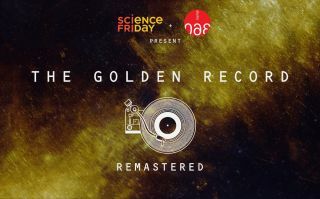 "Science Friday" is collecting submissions for a new Golden Record on the show's website. The winning ideas will be chosen by a panel including Popova, SETI Institute astronomer Seth Shostak and science-fiction writer Kim Stanley Robinson. They will reveal the final selections Oct. 7.